Paris! Most often referred to as city of love or city of lights but might as well be called city of amazing food. While I can’t argue with it being called city of love – it has that romantic feel to it, no doubt, especially if you visit it with your significant other – or city of lights – it really seems like there are millions of lights there, especially if you get the chance to see it from the top of the Eiffel Tower at night – it should also be called city of amazing food. 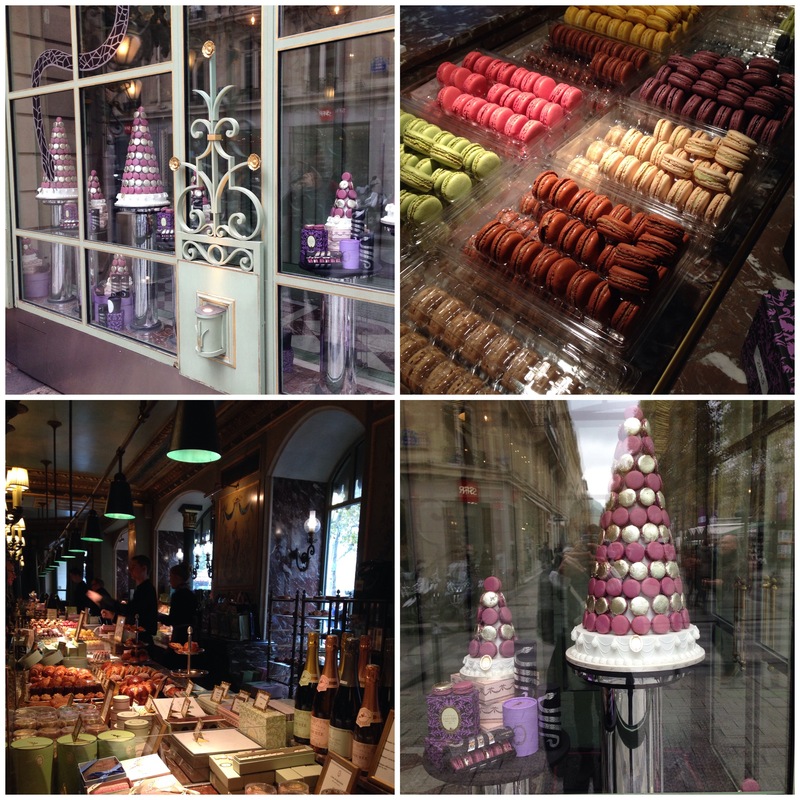 I wouldn’t be me if I didn’t start the blog on my culinary journey around Paris with sweets. 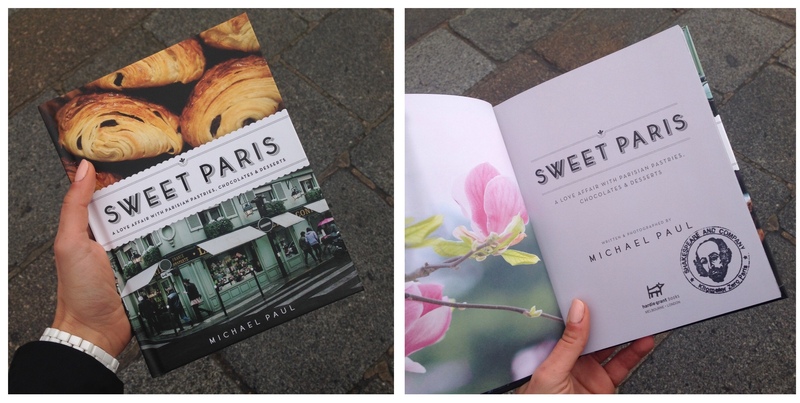 If you are a sweet tooth like me, Paris is your dream destination. 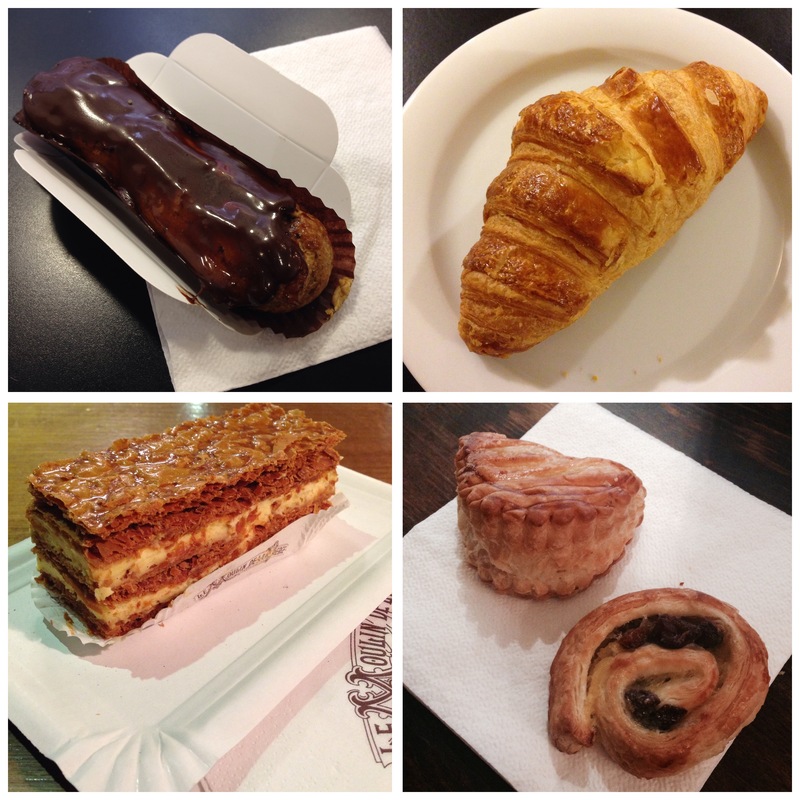 After all, you can start your day with a freshly baked sweet pastry from a cute little bakery just around the corner and no-one will blame you. One of my favorite desserts was éclair – an oblong pastry made with choux dough filled with cream and topped with icing. The dough is typically piped into an oblong shape with a pastry bag and baked until it is crisp and hollow inside. Once cool, the pastry then is filled with a vanilla-, coffee- or chocolate-flavoured custard (crème pâtissière) and then iced with fondant icing. You’ll most likely start your day with a croissant. I’m pretty sure this typical french pastry doesn’t need explaining but what needs to be said is that croissants in France are nothing like you’ve ever tasted in your home country. They are so much better! Another great dessert is the mille-feuille, a pastry made up of three layers of puff pastry, alternating with two layers of pastry cream. The top pastry layer is usually dusted with confectioner’s sugar or glazed with icing or fondant in alternating white and brown stripes. You can’t go wrong if you decide to stop for a snack at one of the bakeries and grab a pain au raisin – a pastry with a sweet custard-like filling and raisins, usually rolled in a spiral – or a chausson aux pommes – a pastry folded in half and baked with a filling akin to apple sauce. 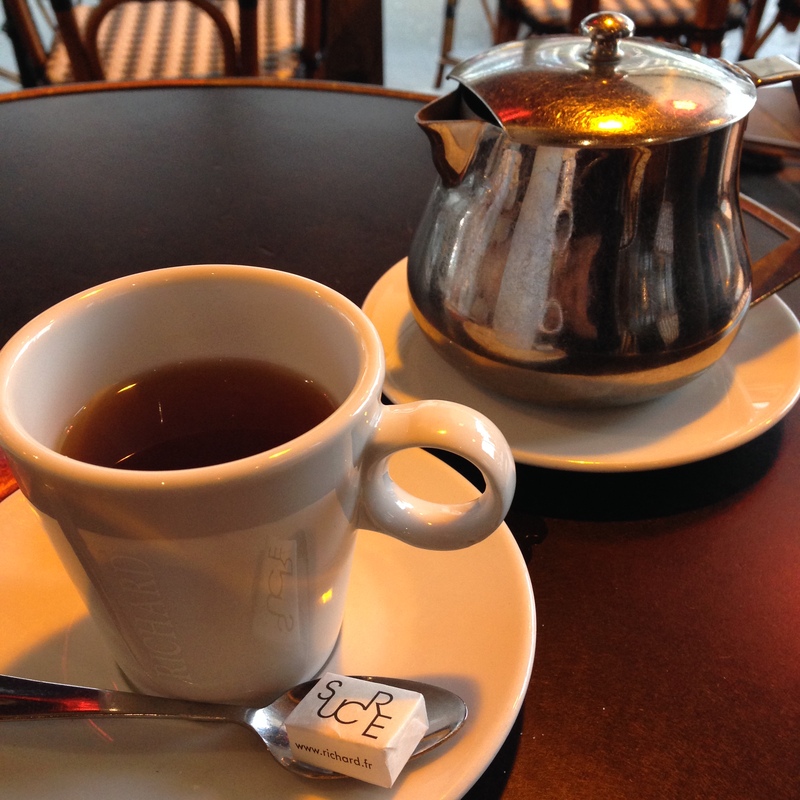 Take some time and sit down for a cup of tea or coffee. 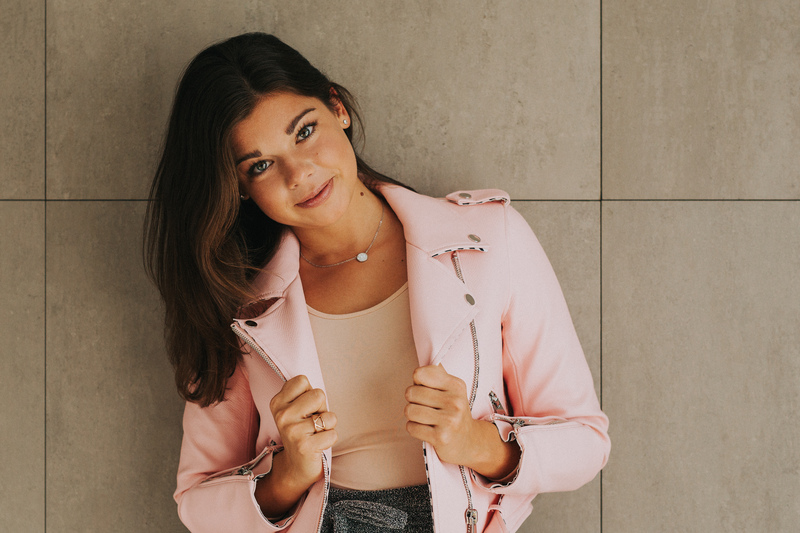 You’ll get the chance to observe the people walking the busy streets of Paris and feel like a true Parisian. 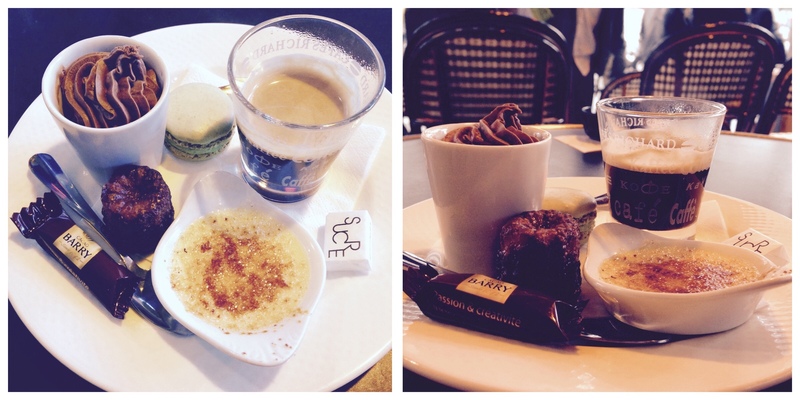 If you decide to have some coffee, go for the café gourmand. This is a culinary concept aiming at proposing an espresso and a selection of mignardises (also known as petits fours) at the same time, served on the same plate. Ours was served with a french macaron, creme brulee, mousse au chocolat, a cannele and some chocolate. Amazing! The first “café gourmand” is believed to have appeared in restaurants in Paris around 2005 and is, in my opinion, the perfect way to taste the best of french desserts without the excessive feeling of guilt afterwards, since all the desserts come in perfect tiny servings. So cute! You can’t leave Paris without trying the macarons. French macarons of course. These are light cookies made with egg whites with a layer of icing in between. I’ve just recently made the perfect chocolate macarons and it was therefore my duty as a food blogger to try as many as possible in Paris to see which are the best. 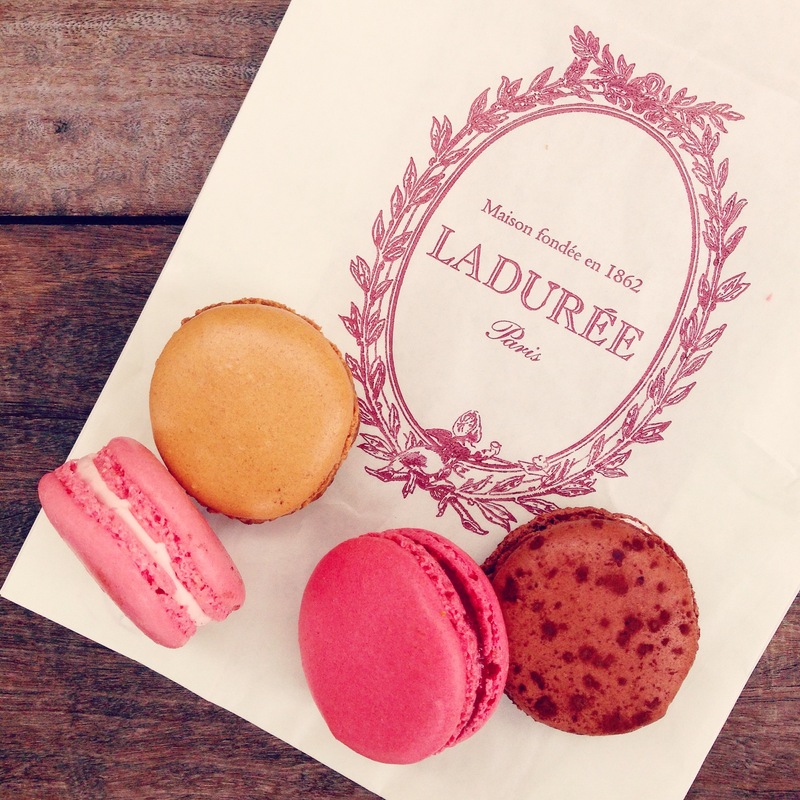 The most famous macarons come from the shop that started it all, Laduree in Paris. I have to say, I was a bit disappointed with their taste. I might have chosen the wrong flavors or just expected too much from them, but I personally didn’t find them that special. They were good, don’t get me wrong, but not that much better than in any other shop. The shop at the Champs-Élysées is, however, impressive and worth a visit. 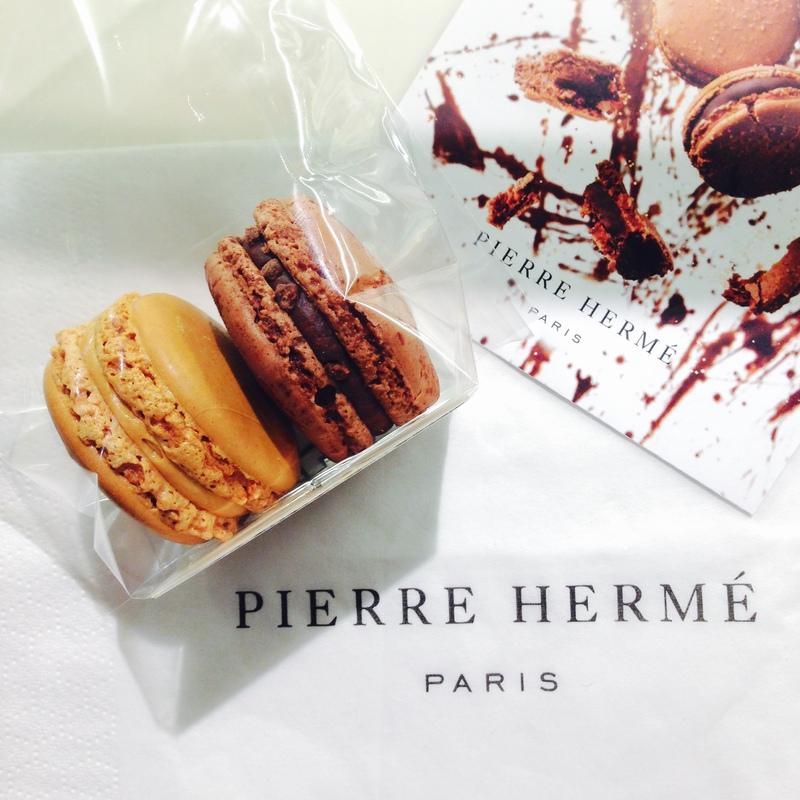 I personally found the Pierre Herme macarons the best macarons I tasted in Paris or anywhere else in the world. They have many shops around Paris. You can even find a few at the Galeries LaFayette stores. Another must-try in Paris is ice cream. While ice cream is a nearly universal phenomenon, there’s an ice cream shop in Paris that you really should not miss. Head for the Berthillon ice cream shop on the tiny Ile Saint-Louis near Notre Dame. Their shop is located at the 29-31 Rue Saint-Louis en l’Île Berthillon’s and they offer amazing gelatos and sorbets. I strongly suggest that one of the flavors you try is salted caramel. Words can’t express how amazingly delicious this flavor is! Last but not least in the “sweet department” are crepes – ultra-thin pancakes filled with almost anything your heart can desire. If you want to play it safe, you’ll go for Nutella or honey and banana, but you have so many other options at almost any food stand that you really can’t go wrong. 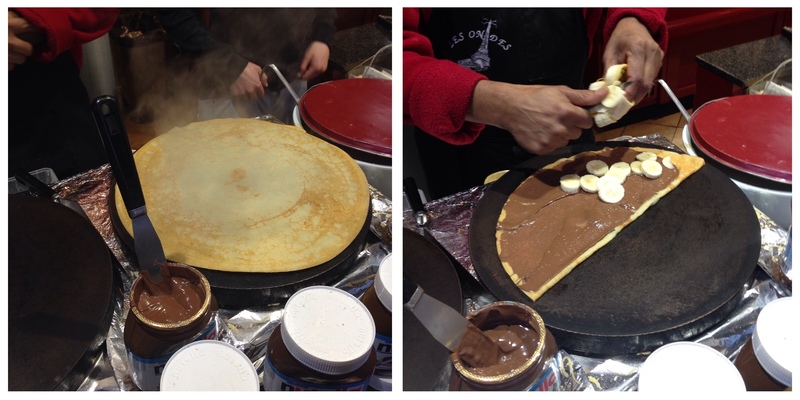 While food stands offer great crepes (head for the ones with loads of people queuing in line, preferably french speaking and not tourists), the best pancakes I’ve had were at the Caramel Sarrasin creperie. 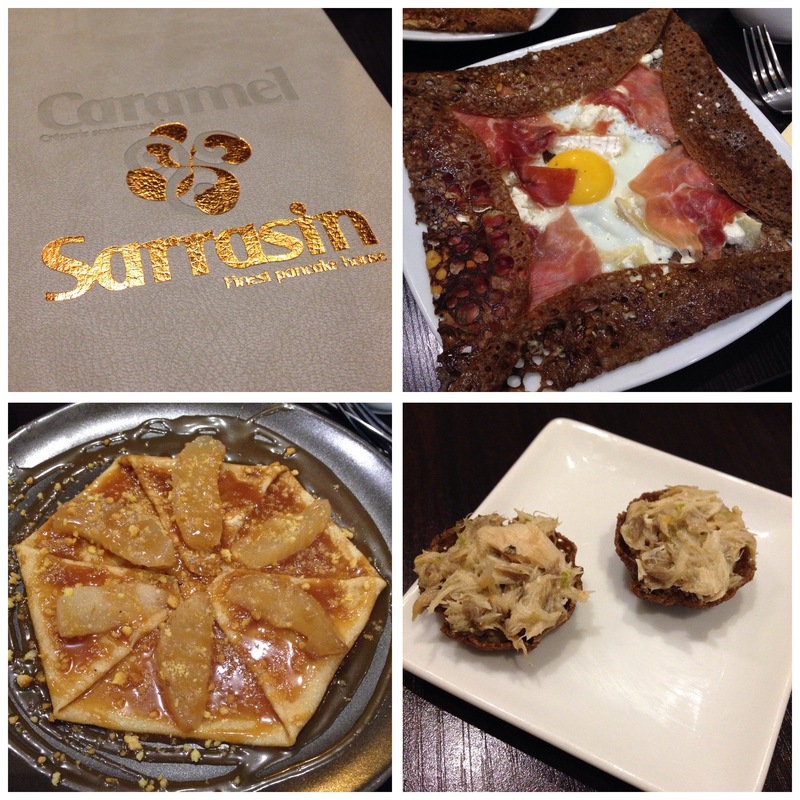 They offer evening menus which include a gallette (see below), a salad, a crepe and a beverage of your choice. Perfect dinner if you ask me! For a transition to the savory part of my blog, galettes are the perfect choice. They are essentially the same as crepes but are more often eaten with a knife and fork, made from buckwheat flour, and are predominantly savory. 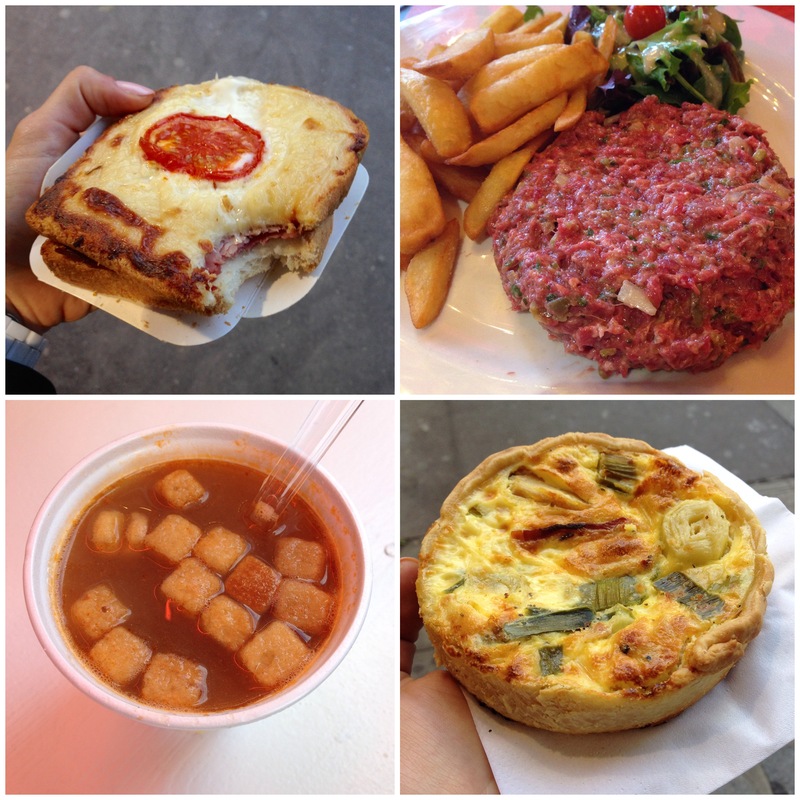 Another popular meal choice at the food stalls around Paris or in restaurants is the croque monsieur. It is a French version of a grilled cheese sandwich with cheese on the outside and ham on the inside. These are often available from crepe stands, so can be eaten as a snack or (for larger ones) as a more complete meal with a salad. If you are feeling a little adventurous, go for the steak tartare – a very finely chopped raw beef that’s been marinated and seasoned. The only “cooking” it’s been through is being marinated in alcohol, but it’s still mostly raw. It is usually served with a side of french fries and salad. Yum! Perfect for the colder autumn and winter days is the onion soup. This is a rich beef-based broth full of onions cooked until they’re soft and sweet, then covered with cheese and baked in the oven. I had mine from a food stand at the Christmas market on Champs-Élysées and it was a perfect choice to keep me warm. An yes, Christmas market already started in Paris in the middle of November! Last but not least on my list of savory delights I’ve tried in Paris is quiche – a savory, open-faced pastry crust with a filling of savory custard. I contains eggs and cream and a variety of other ingredients of your choice. I went for a version with chicken and leeks and found it delicious. You can get mini quiches from almost any bakery in Paris or go for a slice of quiche to a restaurant. Either way it tastes amazing. 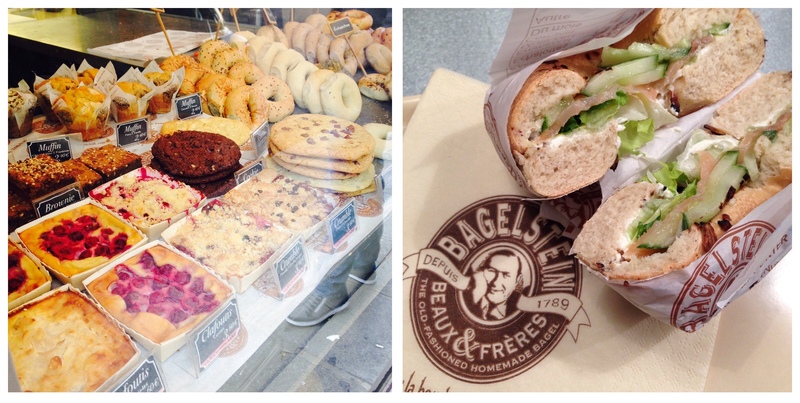 If you are not that into typical French cuisine, I suggest you head to one of the many Bagelstein shops around Paris. They offer different kinds of bagels with fillings of your choice. A perfect option for a quick meal while you’re running around Paris, trying to fit all the sightseeing into the short few days you have on your weekend getaway.